‘Deathtrap Dungeon (A Fighting Fantasy Adventure)‘ by Worldweaver (The developer of The Warlock of Firetop Mountain and The Citadel of Chaos which are still 50% off) is available on the Amazon Kindle site for $3.99! Just click here to download! 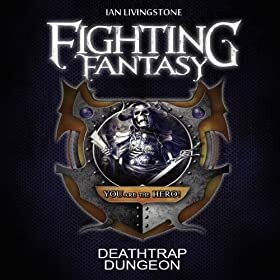 Deathtrap Dungeon brings the third installment of the popular game book series Fighting Fantasy by Steve Jackson and Ian Livingstone to Kindle. In Deathtrap Dungeon, you adventure in the medieval fantasy land of Allansia, where a twisted Baron has set up a great contest which consists primarily of trying to survive the diabolical traps and vicious monsters in the deadly labyrinth, Deathtrap Dungeon. So far, none have survived to lay claim to the prize, but that was before you came along.